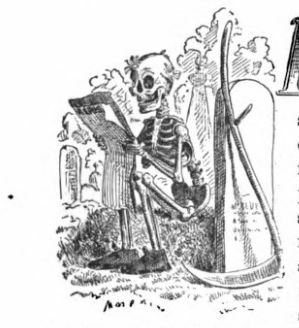 Dead Letters: The Epistolary Zombie Death writes an obit. While burrowing through the literature of the resurrection of the entranced or cataleptic, I ran across several similar cases involving mysterious letters from the supposedly dead. This first story is found in The Headless Horror: Strange and Ghostly Ohio Tales. AN OHIO DEAD MAN SEEMS TO IMITATE HAMLET’S FATHER. This story truly is “passing strange.” I wonder if one of the dead husband’s “pards” from his old Civil War unit learned enough about him to impersonate him? The different locations suggest someone either employed by the railroad or a drummer (a traveling salesman) or perhaps just a man with far-flung contacts. But what about the handwriting? “Old Truepenny” is a term taken (again) from Shakespeare’s Hamlet. It means a true, honest fellow. Dumas is Alexandre Dumas pere, who wrote The Three Musketeers and The Count of Monte Cristo. Eugene Sue was a contemporary of Dumas pere, who wrote lurid novels like The Mysteries of Paris. Both men had a talent for highly dramatic, sensational plots and would have relished this odd tale. Naturally that could not be the end of the story. After publishing The Headless Horror, I found this highly-colored variation. The soldier and his pension have vanished and the widow has remarried. But after wondering at the vulgarity of a person who would use such a solemn subject for a practical joke, the matter was half forgotten. No attention being paid to the letters, others followed in rapid succession, and the friends and relatives, at last alarmed, opened the grave in which Thos. Hubbell had been buried and found that the casket was empty. The wife’s terrible position has driven her nearly wild, and her new husband does not know what to do. In answer to the letter received a few days ago, Hubbell’s brother has gone after the missing man, who is still at a private insane asylum near Cincinnati, and the people of the county are waiting with breathless interest for the return of the long lost man. Matters are terribly complicated, for the property of the deceased man has been divided, sold or scattered, and it will be almost impossible to straighten up the estate. Hubbell’s adventures since his burial thirteen years ago, as told in his last letter, are of an Arabian Nights nature, and were not the proof so conclusive, would be unbelievable The night following his burial, he says that grave robbers took him from his resting place and shipped him in a trunk to one of the Cincinnati medical schools, where he was placed on a dissecting table in the presence of a class of the students. The demonstrator felt about the body of the corpse, making ready for the first cut. The knife was inserted when, to the horror of the demonstrator and his pupils. As it would be hard to establish his identity, and the faculty were afraid of an exposure, which would necessarily make public their methods of obtaining subjects for scientific investigation. In that mad house the man remained for thirteen years, but is now completely recovered, and wishes to return to his wife and friends. The whole story of his adventures has been related to him by the officials of the asylum. He is said to be much changed, but the memory of his entire life previous to his burial has returned to him, and with the proofs given him by the medical men he claims he can fully establish his identity. Now the motif of the cataleptic corpse coming to life on the dissecting table is an old favorite in the bodysnatching canon. For an additional fillip, in a few tales, the “corpse” is then shipped off to an insane asylum. A Supposed Corpse Resuscitated by Resurrectionists. Then there is this similar story of an affectionate but elusive wife. A Man Who Claims to Have Been Receiving Letters from His Dead Wife. “You all thought I died, but I did not, and am better than when I saw you last.” That was the only thing in the letter that would have been thought singular or out of the way by one not knowing the facts. Since then at irregular intervals, several months apart, he has received other letters, all affectionate, but none attempting to explain the mystery, assuming that there is one other than some one is playing a ghastly practical joke. These letters came, the most of them, from Illinois, but one came in June last from Concordia, Kan., near which place he was located up to March, bitterly bewailing the fact that he had left there before the writer got to him. Aimison has investigated the matter to some extent, sending one of the first letters received back to his wife’s parents in Illinois and asking what it meant. They made nothing of the mystery, but agreed with Aimison that the handwriting was that of their daughter. He answered one of the letters addressing it “Mrs. W.S. Aimison” and it came back to him from the dead letter office. A comparable tale of a love buried and resurrected can be found at this link at Mrs Daffodil Digresses. Are these just variants of a 19th-century urban legend—the epistolary zombie, the Scribbling Dead? If they really happened, were they merely elaborate hoaxes designed to extract money from people like Mr. Aimison by claiming to be sick and broke? Or did such unlikely resurrections ever actually happen? What is slightly unsettling about the Hubbell story is that a Thomas Hubbell of the correct date did exist and his tombstone stands at Monclova.